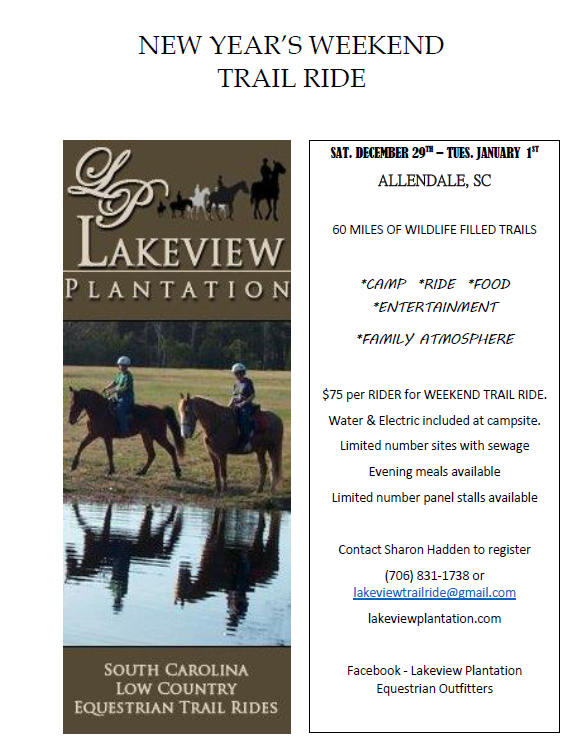 Trail Description Ride at your leisure through a mix of palmetto, pine, cypress and hardwoods on 60 miles of marked trails divided into 9 loops of approximately 7 miles each or explore an additional 40-50 miles of unmarked trails. Campground 72 roomy, camp sites with electricity, water, sewer, an area light and corral panel stalls plus and an additional 88 campsites with electricity, water, an area light and either corral panel stalls or permanent highlines at each site. Showers & rest rooms in centally located bath house near campsites. Directions Driving Directions from the intersection of 278 and 301 in Allendale: Travel south on 301 to Bluff Rd.. Turn left on Bluff Road (S-3-22) and proceed 8.4 miles to Cedar Knoll Road on left. Turn left on Cedar Knoll Road (S-3-60) and travel approximately 2 miles to Lakeview Plantation/Cedar Knoll sign on left.